Moto Parilla produced a series of factory made production race bikes for sale through their importers/main dealers. 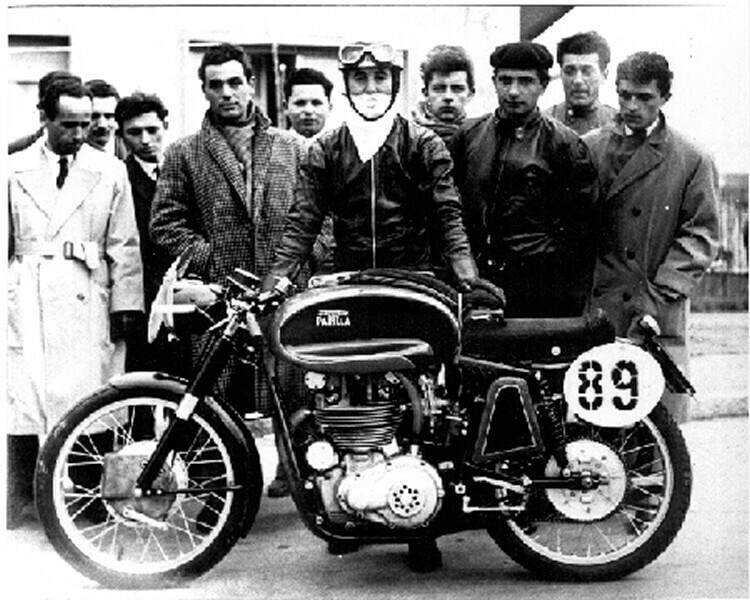 From the late 40’s the factory entered machines in road race events within Italy. From the series of “town” races where roads were shut for a days circuit racing to the 24 hour linear races such as the “Milan – Taranto” & the week long “Motogiro D’Italia” endurance events. All these events were very important to home sales but were virtually unheard of abroad. In the USA, from the late 50s, some competition bikes were imported & these along with the Giro winner rider Rottigni started to make some impact on the racing scene. This ended in the mid 60s with the Parilla being one of the “winningest” marques in the small capacity classes. In the UK there appears to have been little activity other than a dabble in Scrambling with the 250 Wildcat & the odd well-connected Gentleman Racer lucky enough to garner an ex-factory racer. 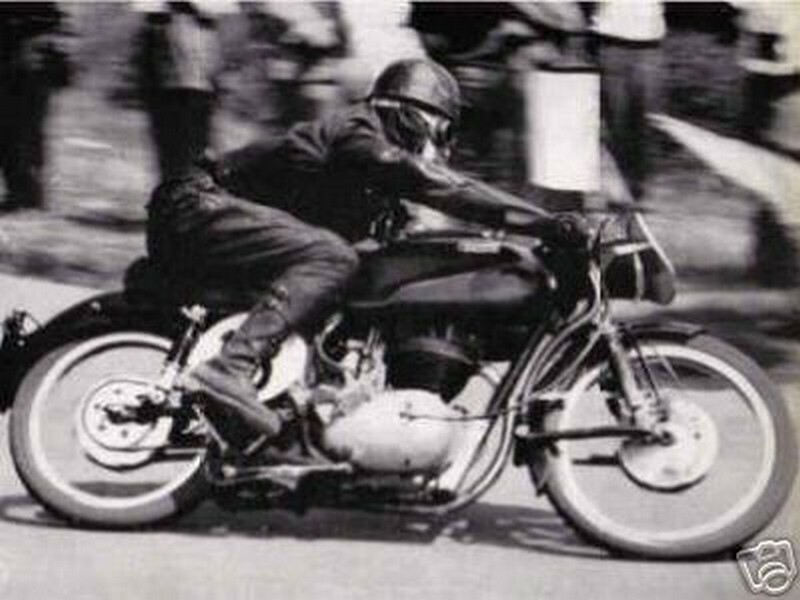 Maurice Cann is known to have raced a 250 Parilla in the UK, our contributor Richard Morley is the only known UK Moto Parilla International racer of the period. As racing in any market is usually entered into by an importer as a means of publicity & increasing sales the marque was at a distinct disadvantage in the UK as all imports were subject to 33% import duty. 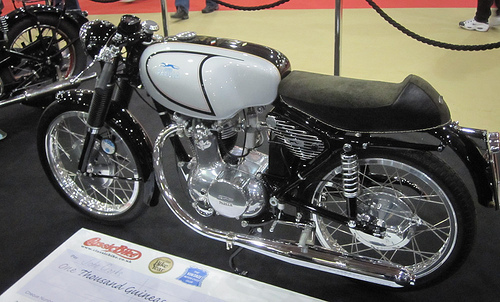 Even if they won everything in sight it would have been unlikely that anyone would buy a 175 MSDS when they could have a 500 Triumph or Norton for the same price. Production competition models as opposed to “works” versions started with the “Competizione” which was equipped with 17″ & 18″ wheels with the front being mounted into Earles type leading link forks. 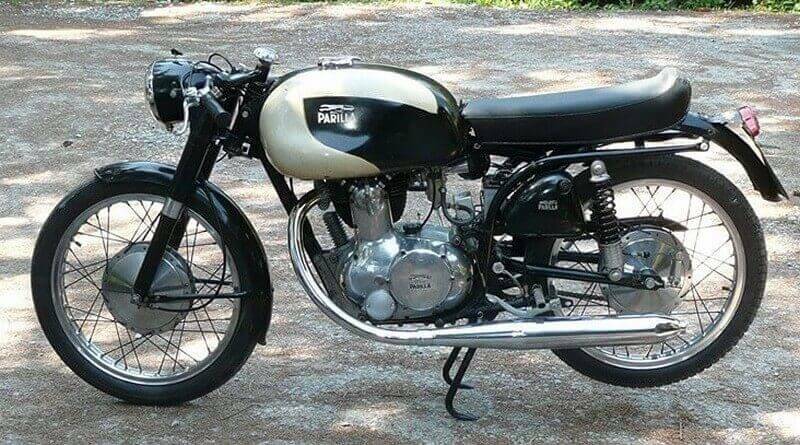 This series of production racers, or MSDS as they were known in Europe (Machina Sport Derivata dalla Serie) continued using the same frame as the earlier model but with a different tank & seat unit. They continued to employ a massive “cigar” silencer in some markets, straight pipes or the “silenced” mega in others. Most of these bikes were 501xxx series numbers. The final version of the MSDS had a different “diamond” frame, tank, seat & toolboxes from the earlier models Some would say they are the most handsome version of all the bikes & are not quite as hard to find as the earlier types…or should I say not impossible to find. These versions carry the 501xxx series number. The standard 500/501xxx series engines were equipped with chain driven cams but some were fitted with all gear drive systems. Hard to tell from the outside. These last versions of the MSDS/GS shared a frame with the more mundane 175 & 250 models. Often referred to as the “Tourist” frame due to its use on that 250 model which was a big seller in the USA…& unknown in Europe along with other 250 models such as the Wildcat & Trailmaster. In the UK a series of special 170xxx 175cc MSDS machines were imported with gear cam drive, CR gearbox & X1 cam. Two complete machines exist in the UK & an engine is reported to exist in Italy. If there are other survivors of this series their whereabouts are not known. 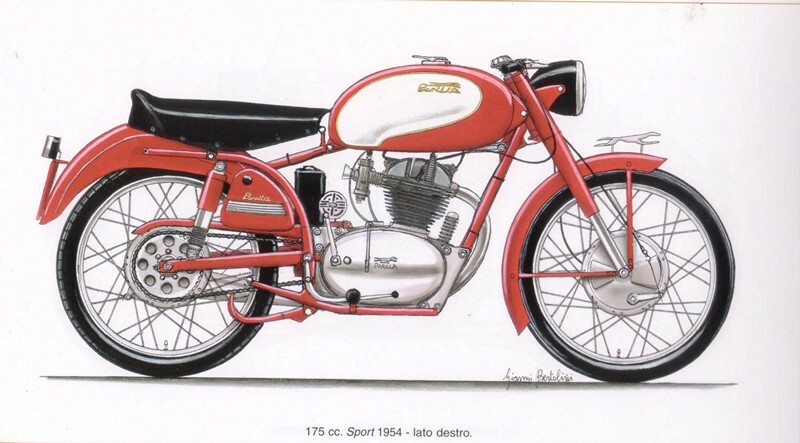 Before the first true hi-cam “Production Racers” were produced by Moto Parilla – the MSDS series – one model rose above the “Turismo Speciale” ride-to-work specification. In 1954 the 175 “Sport” was introduced. 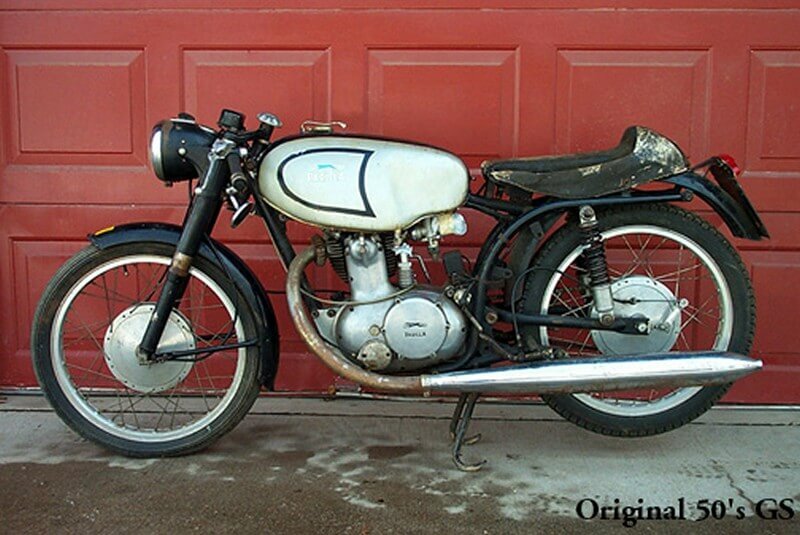 It shared many cycle parts of the TS with an upgraded engine & racing style carburettor being the main difference. The 192mm brakes & large capacity tank of the TS are particularly suited to the Sport with the result that the Sport is often mistaken for a TS until the series number becomes evident – they are the first 500xxx series machines.